Looking for something fun and creative to do outside? Nature Art is a wonderful way to connect with your family and with the Earth in a meaningful and creative way. It is an activity that can be done anywhere and requires no foreward planning and no new materials. Simply walk out into nature, whether that is your backyard, your favorite trail, or a neighborhood park, and use the materials provided by nature to build a sculpture, build and decorate a fairy house, or construct whatever comes to mind. Many artists have taken their inspiration from the environment, and left their art out there to stay and transform, as weather and time plays a part in the project. Andy Goldsworthy builds sculptures using natural materials he finds in that place and then leaves those sculptures to degrade over time. 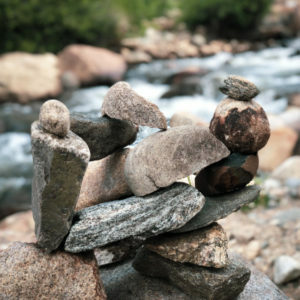 Michael Grab is the artist behind Gravity Glue, a project in which he balances rocks, like trail-marking cairns, in unexpected ways to create mind-bending pieces. Simon Beck dons a pair of snowshoes and goes for a walk in an untouched snow field to create large-scale geometric designs. Richard Schilling uses colorful leaves to catch the light of the sun in his fun works. Nature art is accessible and varied and provides an opportunity to connect with the land while also practicing leave no trace principles. The process of doing nature art is simple. Bring your children outside, show them some pictures of works other artists have created, and let their imaginations run wild. You will be surprised and amazed at how engaged and creative children can be when given very limited instruction. Visit Ford Park in Vail to see, walk through, and even touch, a real-life piece of nature art called Stickwork created by Patrick Dougherty. After you and your children have created beautiful works of art, take pictures to celebrate and commemorate the works. Go back to those pieces of art several times over the next few days and see how they transform over time. Dedicate an area in your yard as a nature art garden and build new sculptures when inspiration strikes. Most importantly, get your hands dirty, connect with the Earth, and have fun! 20 Great Adventures is a mini blog series by Walking Mountains Science Center’s Youth Programs staff to celebrate the organization’s 20th anniversary of providing natural science education to the Eagle Valley. Click here to view them all! Leah Weisman is a Foley Graduate Fellow and Educator at Walking Mountains. Her undergraduate degree was in Studio Art, focusing on printmaking, and she has always incorporated nature into her work creating scenes of the mountains she loves to explore and using natural materials such as leaves and tree bark in her prints.